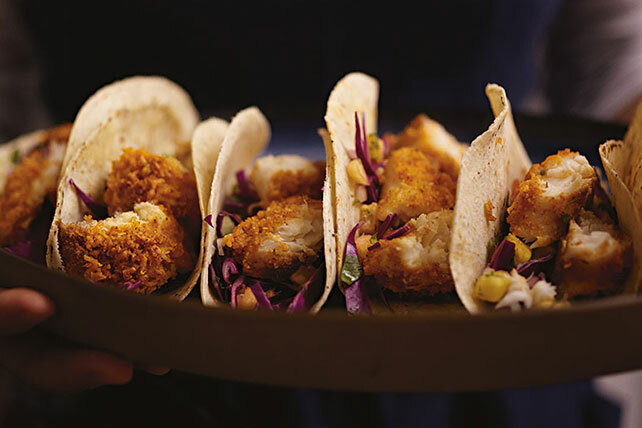 Skip the taco truck line to make tasty tilapia fish tacos at home. Corn tortillas and spicy pineapple slaw add flavor to our Homemade Tilapia Fish Tacos. Combine bread crumbs and seasonings; stir in cheese. Moisten fish with water; coat with cheese mixture, lightly pressing cheese mixture onto both sides of fish. Place on baking sheet sprayed with cooking spray; top with any remaining cheese mixture. Bake 12 to 15 min. or until fish flakes easily with fork. Meanwhile, combine cabbage and salsa. Cut fish in half; place on tortillas. Top with cabbage mixture. Fold in half. Prepare using your favorite fruit salsa, such as peach or lime.